Financial Institutions, like most businesses, need to measure and improve customer loyalty – and compare current levels to competitive benchmarks. Net Promoter® Score (NPS®) is a widely adopted method for measuring, comparing, and improving customer loyalty. As NPS adoption has grown, so has digital banking, now reaching more than half of the entire customer base. This presents a unique opportunity to move beyond statistical sampling to measure each customer’s loyalty and act. Net Promoter Score or NPS is a management tool that can be used to gauge the loyalty of a firm's customer relationships. It serves as an alternative to traditional customer satisfaction research and claims to be correlated with revenue growth. "Net Promoter Score" is a customer loyalty metric developed by Fred Reichheld of Bain & Company. It was introduced by Reichheld in his 2003 Harvard Business Review article, "One Number You Need to Grow." Net Promoter Score (NPS) measures the loyalty that exists between a provider and a consumer. The provider can be a company, employer or any other entity. The provider is the entity that is asking the questions on the NPS® survey or interview. The consumer is the customer, employee, or respondent to an NPS survey. NPS can be as low as −100 (everybody is a detractor) or as high as +100 (everybody is a promoter). An NPS that is positive (i.e., higher than zero) is believed to be good, and an NPS of +50 is considered excellent. Net Promoter programs are not traditional customer satisfaction programs, and simply measuring your NPS does not lead to success. Companies must follow an associated discipline to actually drive improvements in customer loyalty and enable profitable growth. They must have leadership commitment, and the right software and business processes in place to deliver real-time information to employees, so they can act on customer feedback and achieve results. Instead of statistical sampling involving a relatively small number of customers from which inferences can be drawn and applied to all customers or members—Micronotes enables financial institutions to individually measure NPS for a significant fraction of the entire customer population. Micronotes harnesses digital banking logouts to interview customers on their willingness to recommend the bank or credit union to a friend or colleague, and why. Instead of statistical sampling involving a relatively small number of customers from which inferences can be drawn and applied to all customers or members—Micronotes enables the bank to individually measure a significant fraction of the entire customer population, enabling the bank to act individually to correct specific problems with individual high value customers—and conversely, to request referrals from self-identified Promoters or brand ambassadors. The Net Promoter Score is based on the fundamental perspective that every company’s customers can be divided into three categories: Promoters, Passives, and Detractors. 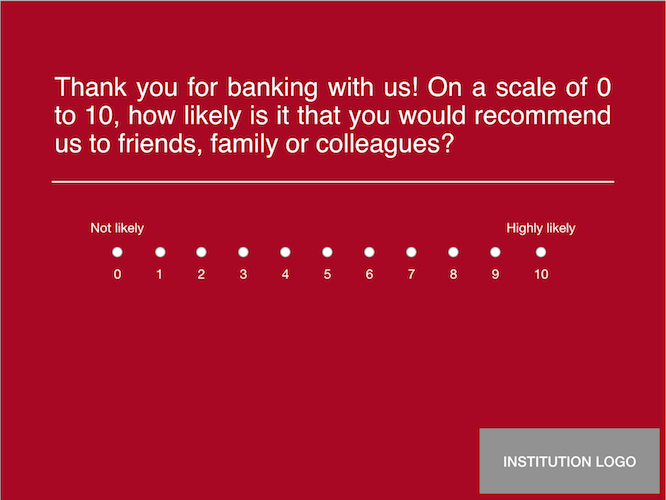 NPS is based on a direct question: “How likely is it that you would recommend our company/product/service to a friend or colleague?” The scoring for this answer is most often based on a 0 to 10 scale. NPS is calculated by subtracting the percentage of customers who are Detractors from the percentage of customers who are Promoters; Passives scores are ignored. Micronotes automatically computes and reports NPS along with the reasons why promoters promote and detractors detract. Individual reasons for detractors are provided to front-line employees and management teams for follow-up action. Local office branch managers at Charles Schwab Corporation, for example, call-back customers to engage them in a discussion about the feedback they provided through the NPS® survey process, solve problems, and learn more so they can coach account representatives. The Micronotes NPS campaign automatically re-engages with detractors for follow-up conversation and invitation for a call-back – all at digital banking scale. Conversely, the Micronotes NPS campaign, together with Micronotes Social™, enables the bank to retarget promoters in social media to help promoters—well… promote! The primary purpose of the NPS methodology is to evaluate customer loyalty to a brand or company, not to evaluate their satisfaction with a particular product or transaction, which is why Micronotes makes this measurement at enterprise scale. The ability to measure customer loyalty is a more effective methodology to determine the likelihood that the customer will buy again, talk-up the company and resist market pressure to defect to a competitor.